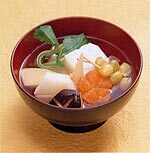 Japanese mochi (rice cake) in soup. It is a Japanese tradition to eat mochi during the New Year. The ingredients vary from region to region. 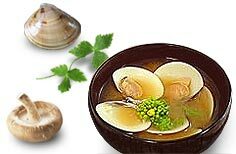 Basically, ozoni (Japanese Mochi Soup) is seasoned with soy sauce in eastern Japan, and with shiromiso (white miso) in western Japan. 1. Cut chicken thigh into small pieces. 2. Put dashi soup stock, chicken, carrot, and shiitake mushroom into a pot and bring to boil. 3. Skim off foam that comes up to the surface. 4. Turn down the heat to low, and add sake, soy sauce into pot and cook for a few minutes. 5. Meanwhile, grill mochi till softened. 6. Add mochi, kamaboko or naruto, spinach and sliced leek into pot and cook for 1-2 minutes. Particularly in Western Japan, it is a custom to eat uncut Makizushi (rolled sushi) called Eho-maki (Lit. “Lucky direction roll”) on the day of Setsubun (refer to Japanese Customs, February 2006). They must eat it quietly while facing the yearly lucky compass direction, fixed by the zodiac symbol of that year. It is said that those who could finish a roll of Makizushi (about 20cm long) are blessed with good luck, good health, longevity and success in their businesses. Makizushi is made with a stuffing of seven colours which represent “Shichi-Fukujin” (seven gods of happiness). 2. Once the rice is cooked, transfer it into a bigger container. Sprinkle some sushi-no-ko over the rice and mix well while fanning it to cool. 3. Place a sheet of nori on the makisu (bamboo sheet) and spread some rice on it, leaving some space on the other side of nori. 4. Put ingredients on (3) and roll it from one side to the other. Chirashizushi is a kind of sushi, which is one of the popular foods eaten on the 3rd of March, Girls' Day (Please refer to the March "Festivals in Japan" under Regulars on our website). 2. Put dashi soup, mirin, soy sauce and sugar (2 tablespoons) in a pan. 3. Add shiitake mushrooms into 2) and simmer till the liquid is gone. 4. Cool 3) and slice them thinly. 5. Beat eggs and add sugar (1 tablespoon) and pour one scoop of egg mixture into a frying pan and make a paper-thin omelette. 6. After making few of 5), cut them into thin strips. 7. Cut cucumber into thin strips. 8. Put 1) in a bowl or a large plate and spread 5), 6) & 7). 9. Place raw tuna or sliced salmon and boiled shrimps on 8). Cherry blossoms are designated the "national flower" of Japan. Since ancient times, it is said that the most loved flower in Japan is the cherry blossom. It has appeared in many literary works, and the cherry blossom design has been extremely popular for almost anything in Japanese life. As the proverb says, "Hana yori dango" (Better to eat sweet dumplings than to view the flowers), people enjoy eating and drinking under cherry blossom trees and have fun at O-hanami (Flower viewing). 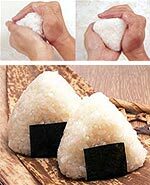 Onigiri (Rice ball) is one of the popular foods for O-hanami as it is easy to prepare. 1. Wash rice and leave it for about 30 minutes before cooking. 2. Mix tuna, mayonnaise and white miso in a separate bowl. 3. Remove seeds from preserved plum. 4. Divide rice into 8 equal portions, wet your hands and form each portion of rice into a ball before making a deep hole in the centre with your finger. 5. Fill 4 of the rice balls with tuna and 4 with ume, then carefully shape each rice ball into a triangle, making sure to enclose the filling. 6. Cut nori sheets lengthwise into strips large enough to encase each rice ball. Stand the flat end of the rice triangle in the centre of each nori piece, then lift both sides of each nori sheet to wrap each rice ball and serve. The spring tide occurs around Golden Week (29th April to 5th May), and the water temperature in the sea will rise by this time. Many people, caught up in one of the typical diversions of the season, go to the beach to gather clams at low tide. 1. Place clams in a bowl, scrub with a brush to clean, then rinse. 2. Soak 1) in cold water for 10 minutes, drain, rinse well and set aside. 3. Put water in a large saucepan and bring to boil. 4. Add shiitake mushrooms and dashi powder into 3), and simmer for 15 minutes covered with low heat. Thereafter, increase heat to medium, add clams and cook for 2-3 minutes covered or until shells open slightly. Discard shiitake mushrooms and any clams that do not open. 5. Lower heat and put miso paste into 4) and stir until miso melts. 6. Just before serving, put mitsuba to garnish. June is the rainy season and the long-lasting rain can be unpleasant. However, rain is important, especially in the agricultural sector. Farmers have rice planting with the rain being showers of blessing. A kind of rice planting ceremony to pray for a bountiful harvest of rice is still held in this day and age. Though the importance of rice is decreasing gradually as the Japanese diet is more influenced by the West, which means that people eat more bread, cereal or noodles than they used to, rice is still Japan's main agricultural product as well as the staple food of many Japanese people. Japanese rice comes in the short-grain variety that is starchier than Thai or Chinese long-grain rice. 1. Cut bamboo shoots into small chunks and boil for 10 minutes, then put into cold water. 2. Cut chicken leg into bite-size chunks and boil for 2-3 minutes, then put into cold water. 3. Put some hot water over abura-age to remove excess oil, squeeze dry and slice thinly. 4. Combine soy sauce, sake and salt in a measuring cup and fill with chicken stock up to the “2 cups” mark on the measuring cup. 5. Wash rice and rinse well. 6. Put 1, 2, 3, 4 and 5 into rice-cooker to cook. 7. Add chopped spring onions after the rice is cooked and serve while hot. When the rainy season is over, the real summer finally begins. There are many “high summer days” when the highest temperature reaches 40 degrees Centigrade or even higher, and “tropical nights” continue with early-morning low temperatures never dipping below 25. At this time, people often eat cold stuff as their appetite decreases due to the heat. 1. Soak leek in a small bowl in cold water for 10 minutes and drain. 2. Drain tofu and pat dry on paper towels, and cut into 4 equal pieces. 3. 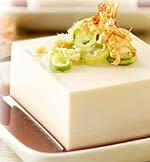 Divide ginger and leek into 4 equal portions and place on top of tofu. 4. Drizzle soy sauce over tofu and serve with bonito flakes on the side. There are many hot, sunny days with record-high temperatures throughout Japan in August. In the past few years, the temperature had gone up to as high as 40 degrees centigrade in some areas. Bon-odori, folk dancing, is held in many communities all over the country during O-bon (a Buddhist tradition upholding the belief that the souls of one's ancestors return to this world) from 13th -16th August. Men and women of all ages are clad in yukata (summer cotton kimono) and they dance to music in a circle around the yagura (stage). Each local prefecture has its own traditional style of bon-odori. 1. Wash and cut strawberries. 2. Combine strawberry puree and flour together in a bowl and mix till soft dough is formed then roll the dough into small balls. 3. Drop 2) into boiling water in a pan and boil for 2-3 minutes. 4. Transfer 3) into cold water to cool. 5. To serve, add 4), fresh strawberries, some whipped cream in a serving bowl and top it off with ice-cream. The full moon at this time of the year is called "Chushu no Meigetsu" (the beautiful moon of mid-autumn). Since long ago, the Japanese have been enjoying O-tsukimi (viewing the most beautiful moon of the year). 1. Soak seaweed in cold water for 5 minutes or until reconstituted. Drain and set aside. 2. Cook noodles according to instructions on package. 3. Drain 2) and rinse well in cold water to remove excess starch on the surface. Divide into 4 medium bowls. 4. Put 1), leek and red pickled ginger in equal portions into 3). Arrange this on top of the noodles and crack an egg into the centre of each bowl if desired. 5. Put dashi powder in water, mirin and soy sauce into a saucepan. Stir and boil. 6. Pour 5) immediately over noodles, and put some seven-spice pepper powder, if desired. October is the best season for outings as the weather is neither too hot nor too cold. Newly harvested rice appears at stores around this time of the year. Autumn fish such as mackerel, sardines and saury pike are also in season. 1. Remove the hard fin part near the fish tail and the gills from the belly of the fish. Make a slit along the belly of the fish and carefully remove the innards. 2. Wash and pat dry with paper towels. 3. Make 2-3 shallow lengthwise slits on both sides of the fish to ensure even cooking. 4. Rub salt on both sides of the fish and place under a preheated broiler or on a barbecue grill. Cook each side for 4-5minutes or till golden brown. 5. Serve each fish with a mound of grated radish drizzled with a little soy sauce and lemon wedges. In November, the weather gets colder, and red and yellow leaves appear on trees throughout Japan. People go out to autumn foliage viewing spots. Viewing the autumn leaves is one of the people's favourite pastimes during this season. At the same time, this is the season to enjoy blessings from the sea like cod, blowfish, oyster and salmon. 1. Soak shredded leek in a small bowl of water for 10 minutes and drain well. 3. Put salmon, dashi powder, mirin and soy sauce in a bowl. Toss well and then marinate for 30 minutes. Place on a lightly greased, aluminum-lined grilling tray. Grill each side of the salmon under a preheated broiler for 3-4 minutes on medium heat. 4. Cool 3) and flake with a fork. 5. Divide rice into 4 medium-sized bowls. 6. Put 4), 1) and nori cut into thin strips onto rice in each bowl equally and gently pour hot green tea. Sprinkle sesame seeds and serve immediately. Soba (buckwheat noodles) symbolizes long life because of its long shape. Therefore, soba is eaten on New Year's Eve (31st December ) with the wish for a life as long as noodles in the coming year. 1. Cook noodles according to the package instructions, drain and rinse well in cold water to remove excess starch. 2. Heat oil in a large frying pan or wok over high heat. Add onions, garlic and carrots and stir-fry for 2 minutes. 3. Add pork, capsicum, and cabbage into 2) and stir-fry for another 2 minutes. 4. Add noodles, sake and soy sauce into 3) and stir-fry till noodles are heated through. 5. Pour tonkatsu sauce or steak sauce into 4) and stir-fry for 30 seconds and serve hot. 6. Garnish with pickled ginger, green seaweed flakes and dried bonito flakes.